A lot has happened since my last post – I’ve had a 10 month hiatus from the world of Chez Lark, this past (and last) school year at UW-Madison completely consumed my life. But if there’s anything to warrant breaking radio silence, it is the experience I had today. It seems that in all of the traveling across the United States that I’ve done in the past four years, I never had the chance to really be a tourist. I’ve criss-crossed the country numerous times for my photography business: when I first started doing my fine art architectural photographs of LDS temples back in the Fall of 2010, I traveled over 13,000 miles in four months (thank heavens for cheap Southwest flights!!). In the middle of my 2nd year of grad school. No joke. I have no idea how I managed a 4.0 GPA that semester or how I stayed on top of my teaching responsibilities, but I did… Since then, I’ve racked up another 10,000 miles. That’s 23,000 miles within my own country, not including hopping across the Pond a few times and traveling around France and Senegal. But truth be told, I never really got to see very much of the American cities I was in – usually I was in and out in 24 hours. 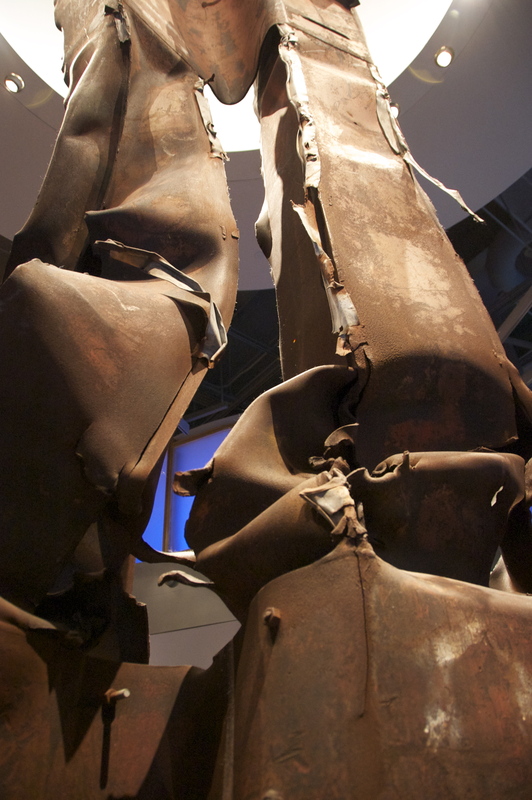 The 9/11 portion of the exhibit was extraordinarily touching, and it really choked me up. 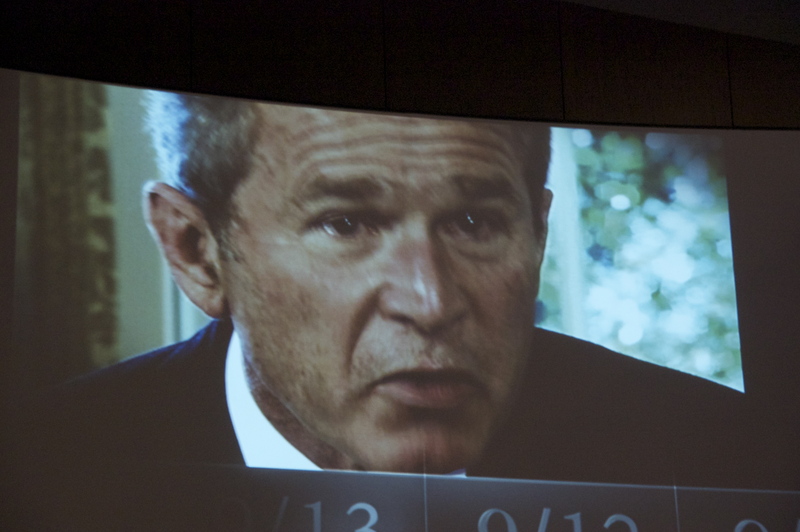 Up until that point, the displays, videos, and photographs followed a fairly predictable chronological pattern from President Bush’s birth to his election as president. The first few months of his presidency followed the same chronological trajectory and focused on how he began building the foundation for the platform he ran on. When I was in the section containing the displays about the “No Child Left Behind” program (which I wasn’t really interested in), I heard a couple of docents tell other patrons to prepare for the changes that would take place when they turned the corner into the next area. I glanced up and to my right and noticed decals on the walls which, beginning with September 1, 2001, broke down events from the President’s schedule in 1-2 day increments. I thought, “Oh, she’s talking about 9/11 – everyone kind of has an idea of what will be in that room. What is there to prepare for?” I went back to reading some of the placards, and a few minutes later I finally made my way to the small breezeway that connects the “No Child Left Behind” and the 9/11 exhibits. The sight of those two beams literally took my breath away. I gasped, and immediately a huge lump formed in my throat and my vision blurred with tears. The similarities between the beams and the silhouettes of the Twin Towers are hard to miss… Fault of mechanical reproduction, this picture doesn’t do these justice, nor does it adequately convey how touching and emotional it is to see them. The picture automatically distances the viewer from the visceral power that permeates this room. Let me tell you that seeing the images of the WTC flash across a TV/computer screen or seeing it in print is entirely different than seeing debris from Ground Zero less than 25 feet from your person. I stood there and tried to regain my composure. It took me a little while. I then noticed that the walls surrounding the beams were engraved with all of the names of the individuals who died on the 4 airplanes (NYC, the Pentagon and the Pennsylvania field), everyone who was known to be in the World Trade Center at the time of the attacks, and the people who died at the Pentagon. 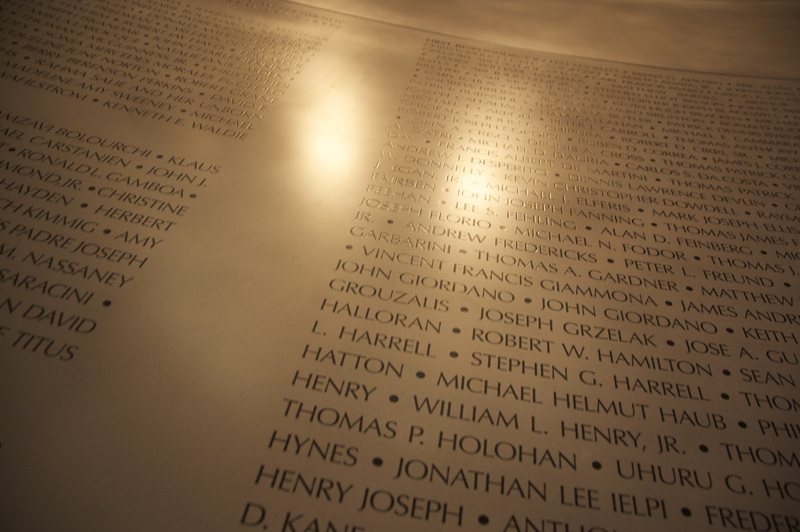 Over 3,000 names are on those walls. The walls are made of some type of metal (which carries the steel theme throughout the rotunda). Another lady and I simultaneously reached over and touched them, looking up at all of the names. The docent came up behind us and placed his hand gently on my shoulder. (He’s in the dark suit in the previous picture). He said softly, “I’m so glad to see the two of you touch the walls. It really humanizes the experience in this room and allows you to connect with what happened. Most people don’t know how to process seeing 3,000 names stretch across the walls, and I’ve seen very few individuals reach out and touch anything in an effort to physically connect with what happened and with those who died.” His eyes were teary and he gave me a sad smile (and that didn’t make it any easier to swallow the lump in my throat). Then he pointed out two names and told us the story of who they were and what they were doing when they died. Then he let us be. 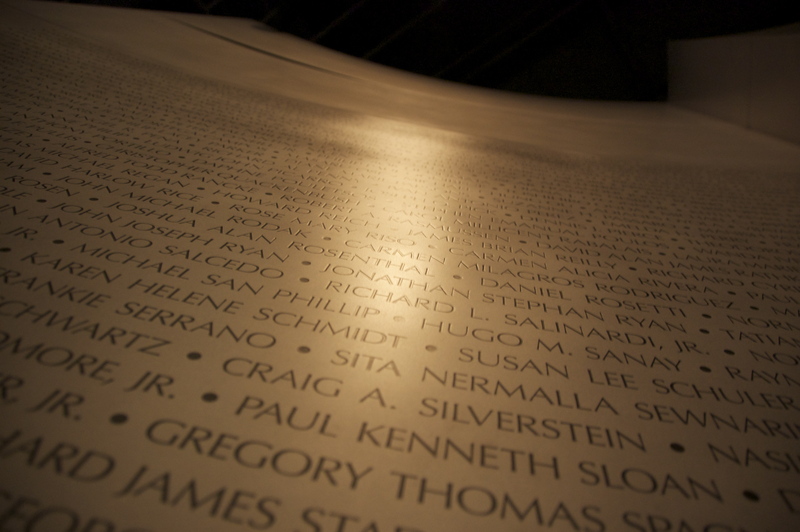 Some of the names of the 3,000 people who died on 9/11. 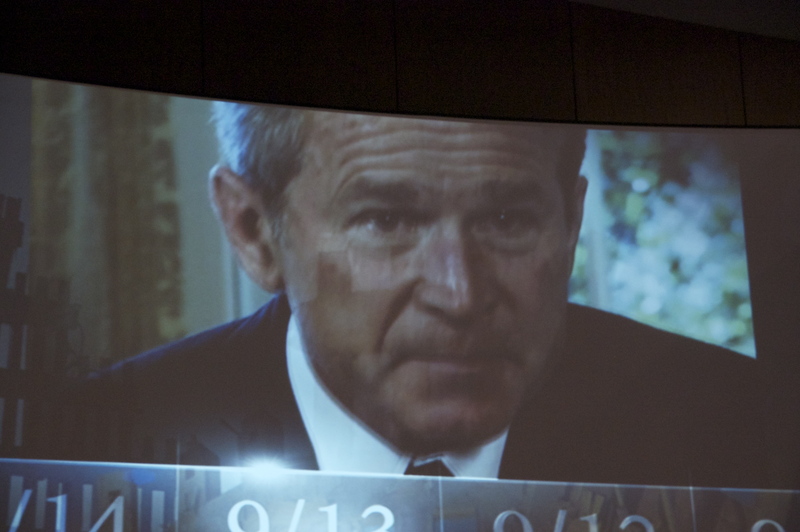 Five TVs were set into the walls and they showed news footage of the attacks, when the towers fell, and the crash sites at the Pentagon and Pennsylvania. 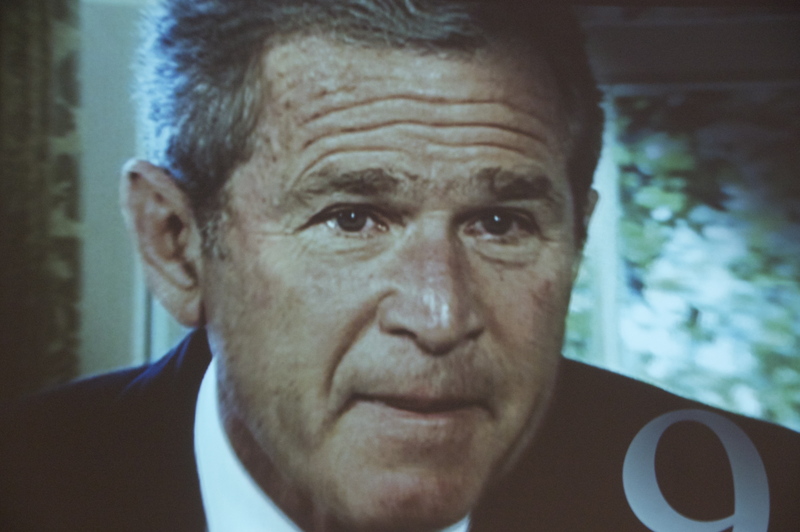 A small theater played videos of President Bush’s visits to the various sites, Laura Bush’s remarks during the memorial service in Pennsylvania, Bush’s addresses to the nation, etc. The image that stayed with me the most from that montage was a spontaneous interview in the Oval Office on September 12 or 13. A reporter asked him how he was feeling and how he was coping. He cut her off with a slight gesture of his hand and said, “I’m not thinking about myself, I’m thinking about those who lost their lives and their families.” The camera zoomed in close to his face as he said something to the effect of “I’m someone who has a job to do, and I am determined to do it.” He said some other stuff that I can’t recall, but his expression was the most important thing. I’ve read a lot and heard some individuals express the opinion that he and/or members of his administration was/were in on the attacks or that the attacks didn’t happen the way we think they did. I have always thought that was ludicrous, and looking at his eyes when he was speaking, I am even more convinced that the conspiracies theories concerning his involvement or prior knowledge aren’t well founded. His eyes were teary, sad, and exhausted – there was a mixture of anger against the people who attacked us, and with frustration with the situation facing our nation. But there was also the unmistakable, heightened awareness of a protector and the dogged persistence of a fighter, who moments before had been pounded into the ground but was now standing and staring into the eyes of his opponent, resolved to come back from near defeat and win the fight. In all of the podium thumping, vocal emphases placed on certain phrases, and steely gazes directed at the camera/audience during rehearsed speeches that politicians resort to (including him), I have never seen him look like that. Furthermore, it’s been my experience dealing with individuals (and myself) that one cannot fake that kind of mixture of emotion, indignation, and determination. I was so taken aback by what I saw that I sat through the video again just to study his body language and his eyes one more time. It’s really hard for me to put words to what I took away from that… All in all, I like George W. Bush, the man. He was never pretentious. What you saw was what you got (for better or worse) and when I peel back the policy and just look at the man, I have always felt that he was a genuine individual. That being said, I don’t think President Bush always made wise decisions, and he obviously made mistakes during his administration. But it’s always easy to criticize from the sidelines with a bemused smirk or an air of intellectual and/or political superiority. Being eye-to-eye with crises and difficult decisions is a lot different than seeing it from the living room couch without being privy to all of the information at hand. That applies to whoever is in office, and I admit that I have been guilty of that on occasion. Newsflash #1: contrary to popular belief, the press isn’t omniscient, either. Newsflash #2: objective, unbiased reporting no longer exists – Yellow Journalism is still alive and well. We’ve grown so accustomed to it that we don’t always recognize it. Anyone who tells you differently isn’t as educated as s/he thinks s/he is. So with that, coupled with 20/20 hindsight spanning the last 13 years, I watched his eyes closely during that video. I guess you can say that after seeing him respond, I gained an added and deeper dimension of respect for him as a man and as the President. 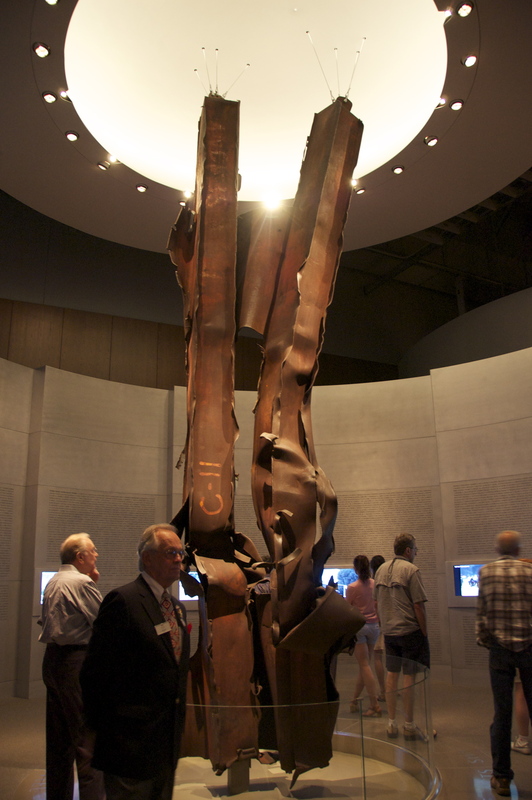 I spent most of my time in the 9/11 exhibit. It was an opportunity to reflect on what I was doing and what I felt that day. 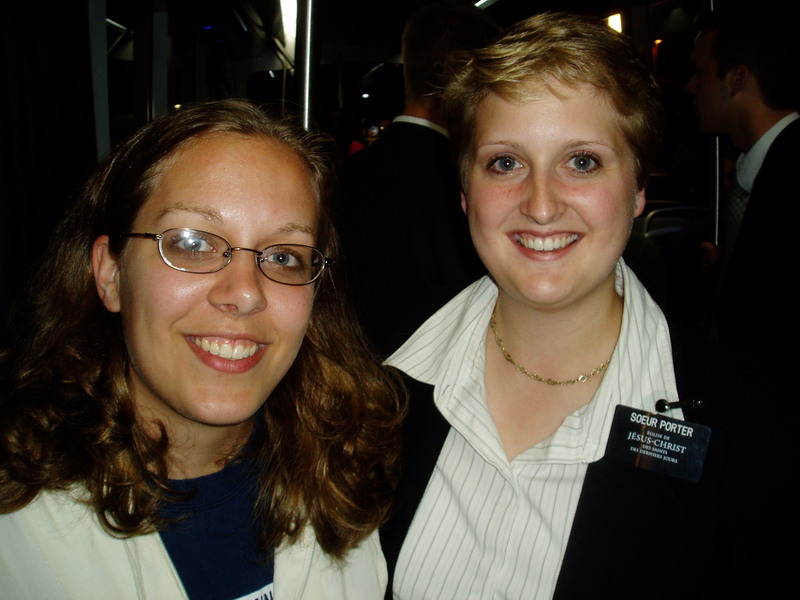 In September 2001, I was a brand new freshman at BYU – the semester had started only the week before. When I first gathered that something serious happened in the US that morning, I was eating breakfast in the cafeteria of our dorm. Usually they had music from the radio piping through the cafeteria, but that morning it sounded more like a radio talk show than the regular mix of easy-listening. Radio talk shows have always driven me nuts (give me the music!! ), so I tuned it out. But eventually I noticed that people weren’t really eating – they were listening. I slowly made out something about planes and buildings, and that the President’s safety was at risk. I stumbled my way to class (which happened to be American history). It was in a small auditorium with a large projector screen, and by the time we all got there, the professor had CNN playing. We didn’t do anything during class but watch the news. No one spoke. We just watched. And cried. For 75 minutes. When the bell rang the professor held us longer and prayed with all of us. Since it was a Tuesday, and every Tuesday the university has a devotional/forum at 11 am, we filed toward the Marriott Center. That day the university president was supposed to welcome us to a new school year. Usually a little less than half of the basketball arena filled up for those meetings, but that day all 20,000 seats were filled. 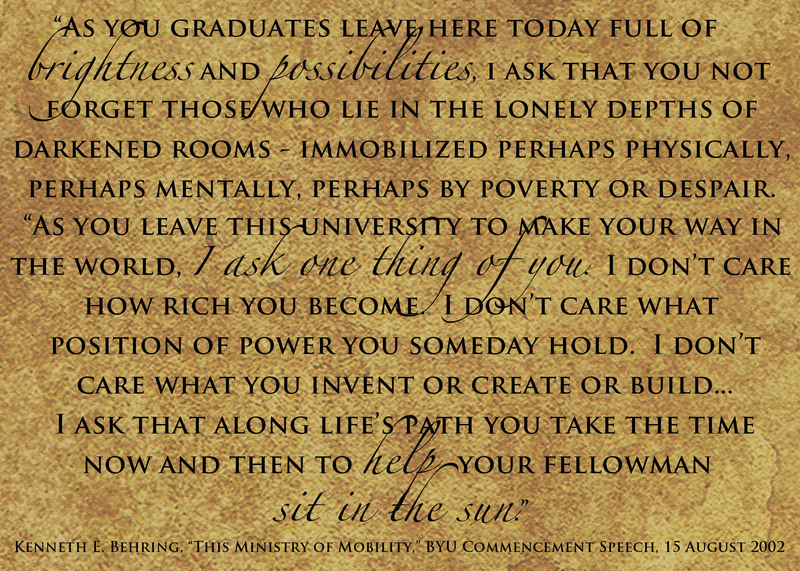 President Bateman (BYU’s president) didn’t give his remarks. Instead he prayed with us – somehow he kept his composure – and he told us to go home and call our families. He said that his office had pulled all of the names of students who were from the NYC area, and he advised them to do all that was possible to contact their families. He said that university officials would be working their connections in that area of the country to help get as much information about those students’ families. Then he shared some scriptures about faith and the Atonement of Christ. The only other class I had that day was Karla Nielson’s interior design class – we’d only had one or two classes with her prior to 9/11. It was a very small class (18 students instead of her usual 200). I don’t recall exactly what she said, but I remember watching her and listening fixedly. She of course expressed sadness about what happened, but I remember being impressed with how much faith she articulated. She said something to the effect of “This is not a time to turn away from and curse God. This may very well be one of our life ‘Job’ experiences. Remember Job’s faith and how he turned to the Lord and became closer to Him in difficult trials.” She gave her full lecture that day – which, as I have learned while getting to know her very well over the past 13 years, is just like her. Take time to mourn and re-ground your faith. Then get back to work. Typical Karla. I’m pretty sure that I spent time with my sisters that night – and we probably called our parents. But I don’t remember for sure. Thursday the 13th, my American history professor showed a movie that he had found somewhere of videos taken from airplanes from various places in the USA, and Neil Diamond’s America (with extra bass) played in the background. We cheered and cheered (cried). We watched it again. And we cheered again. I remember that during the weeks and months that followed, there was a greater sense of patriotism and pride in our country. There was also a greater outpouring of faith and belief in God. People were kinder to one another, and for a while, people focused on family rather than their paycheck. Congress came together and got things done. Hopefully we can regain that as a country – but let’s hope it doesn’t take such drastic events to help us get there again. 9/11 affected all of us in one way or another. I didn’t lose a loved one in those attacks. But the attacks and the subsequent military action meted out against Afghanistan and Iraq did directly affect the lives of my family. Like so many others families, some of my immediate family members either enlisted in the military very soon after 9/11 in an immediate response to the needs of our national security, and all of the service members of my family were deployed overseas. I am very grateful for their desire to serve, their dedication, and the many sacrifices they made to help ensure our freedoms. 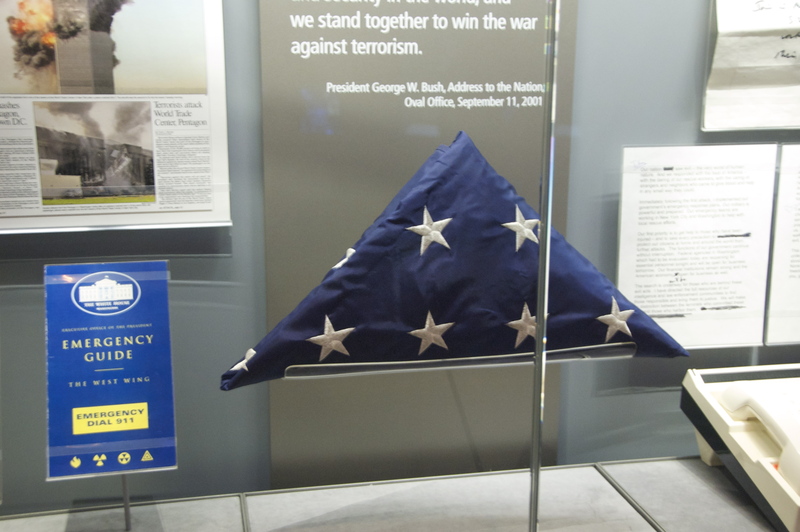 Hundreds of artifacts were on display in the 9/11 section of the museum – unfortunately there were too many to photograph, and even if I could, not all of them were under enough lighting (no flash photography), so they wouldn’t have come out right anyway. 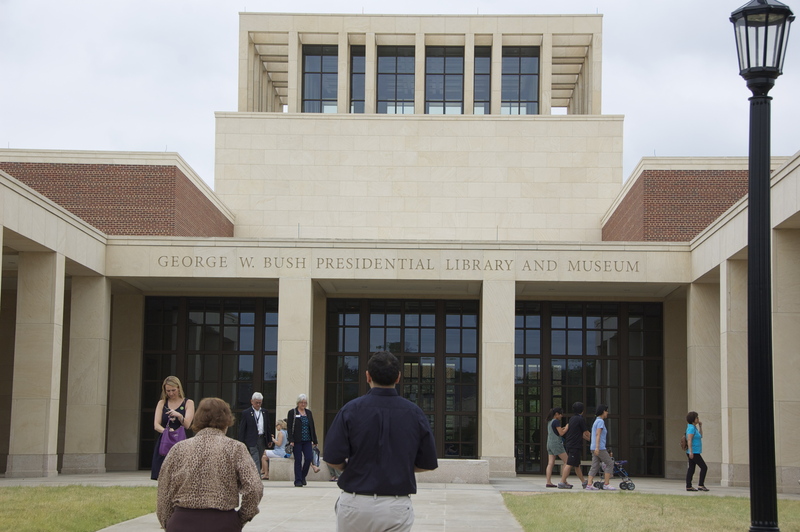 Just like the focus of his presidency shifted after the attacks, the direction of the rest of the museum’s exhibits changed from that point on. Instead of progressing chronologically the presentations focused on issues and initiatives, and they drew from all 8 years of his time in office to form a conglomerate of decision points and the subsequent consequences. All of the exhibits were phenomenally done, and I plan on going back next weekend to see the rest of the museum and library. I will write more about the other sections in a later post. 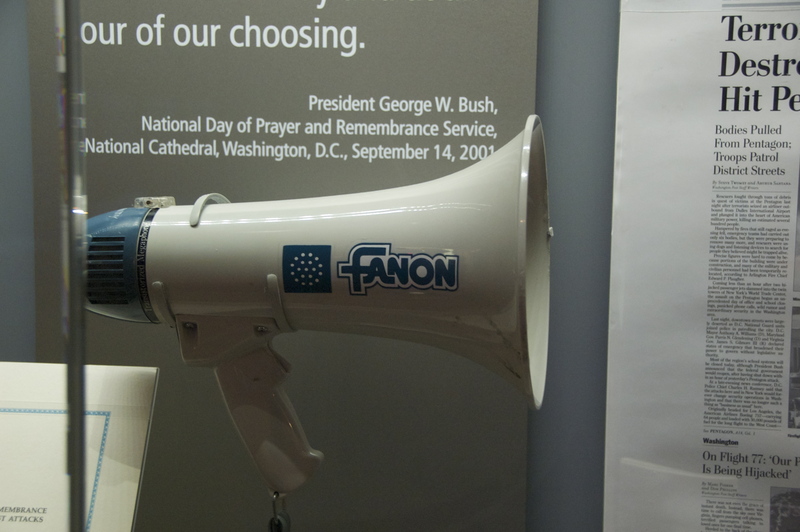 Regardless of one’s political persuasion, the 9/11 exhibit is a must see. If nothing else it gives everyone a chance to physically connect with what happened. If my experiences are like everyone else’s, it also gives rise to introspection and an opportunity to determine whether the resolutions we made and the priorities we set during our healing process are still in force. I, for one, have some course corrections to make… In the end, today was an emotional day for me. I’m proud to be an American. May God continue to bless America. Ten years ago this weekend (March 9, 2003) was the beginning of a major turning point in my life. You see, 10 years ago I made the decision to serve a mission for The Church of Jesus Christ of Latter-day Saints. And I can say that bar none, that was the best decision I have ever made in my entire life. I think it’s safe to say that most people who knew me as I grew up – especially my family – always figured that I would serve a mission. No one ever said anything about it, no one ever pressured me to serve one. But because my religion was such a big part of my life, I embraced it voluntarily and whole-heartedly – and I was in the habit of working with the missionaries in my hometown and often gave Books of Mormons to my friends and elementary and high school teachers – I think people naturally assumed that I’d follow in my father’s and both of my sisters’ footsteps and serve a mission. So you can imagine people’s shock when I announced sometime during my first two years of college that I wasn’t going to serve one. I had decided to focus on my studies and finish up the art program quickly so I could graduate and move on with my life. 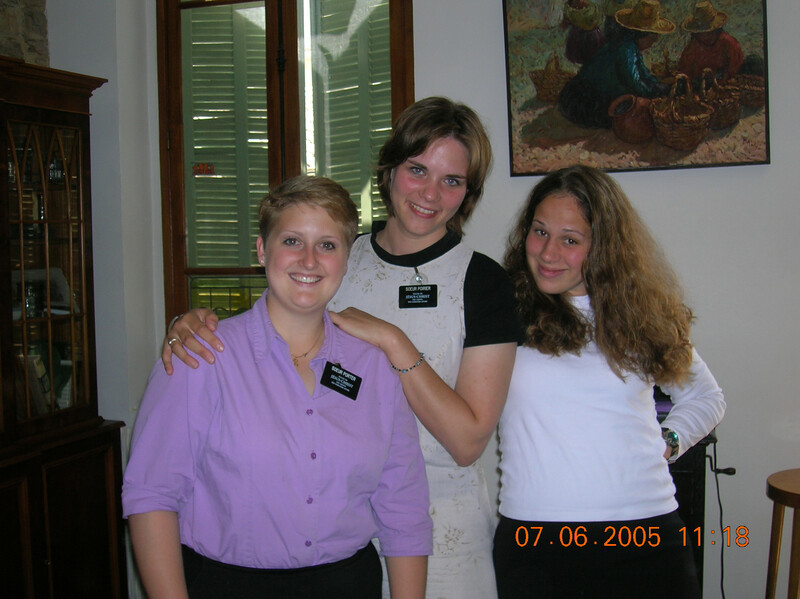 And I was ok with that – females aren’t required to serve missions, and I figured that I’d be able to contribute to missionary work by serving in my church and continuing the good habits I’d already developed. So you can imagine how completely blindsided I was when I received the impression that I needed to serve as a missionary. I mean it literally came out of nowhere and at a time when I least expected it. The experience was so unique, so powerful, and as I said above, so life-changing that I remember the exact date it happened, where it happened, who I was with, and if I were to return to the room where it happened, I can tell you exactly where I was sitting. March 9, 2003 was stake conference (a church meeting comprised of about 1500-2000 college-aged students who lived in the same geographical area), and the meetings were held in the Wilkinson Center ballroom on the BYU campus. I was in the middle of fighting a cold, so I wasn’t in the best spirits – my throat hurt, my nose was runny, my eyes were really itchy, and I had a pounding headache. To put it frankly, I was not too thrilled about being at the meeting – in fact I had absolutely no desire to be there. I would have much preferred to be home in my nice warm bed sleeping. I sat grumpily in my chair and promptly tuned out what the speakers were saying. From time to time I shifted uncomfortably in my seat, wishing that my head would stop hurting and that I could just go back to bed. Elder Butler, an area authority, and his wife were there presiding over the meeting. Evidently the Butlers had just finished a 3-year assignment as mission presidents of the Massachusetts Boston Mission (at least that’s the mission I think they presided over), and two of their former missionaries were in our congregation. Elder Butler asked those individuals – a male and a female – to come to the rostrum and bear their testimonies. The young man went first. I have no recollection of what he said. My headache prevented me from really focusing on what he was saying, and even if I could have, remember dear reader, I was being a total brat and I had categorically refused to enjoy the meeting. I don’t really have the words to describe what happened next. The closest thing to even begin to portray what happened is to say that an invisible force hit me like a ton of bricks, almost like it had grabbed me by the shoulders and shoved me upright. It was practically tangible, and I sat straight up in my chair. I sat up so fast that I scared DeAnn – she even jumped, poor thing! My other two roommates were sitting on the opposite side of me, and they turned and looked at me, too, trying to figure out what was wrong. Needless to say, that snapped me out of the negativity I was wallowing in. All of my attention was directed at the words that accompanied that “shove.” They weren’t louder, but they pressed upon my mind with a lot more force. You need to serve a mission. The quiet, piercing words responded, That doesn’t matter. You need to serve a mission. Then a calming warmth enveloped me, and it felt as if my heart was on fire. I immediately felt those same words. You need to serve a mission. I quickly enumerated the reasons why I “couldn’t” go on a mission – i.e. : I was making significant headway in the illustration program, I was almost done with school and it didn’t make sense to take a break from my studies, there was a young man that I was interested in and was willing to see where our relationship went and plus, I really didn’t want to go to France. None of those things really matter. You need to serve a mission. Needless to say, I didn’t pay attention to the rest of the meeting (par for the day). I vaguely remember seeing Elder Butler deliver his address, but I have no idea what he said. I sat in that chair arguing back and forth with that voice (and for the record, no I am not schizophrenic). I presented all of the things I thought were valid reasons to why I couldn’t or shouldn’t serve a mission, and each time I did, that burning feeling increased to the point that my whole body shook and tears streamed down my face. Finally the meeting ended, and I made a bee-line home. I don’t even remember the walk back, nor do I remember if my roommates returned with me. The next thing I knew I was locked in my bedroom, kneeling at the side of my bed and trying to gather my thoughts before I prayed to God. Finally I said, “Heavenly Father today I have had many impressions that I should serve a mission. I know that they came from Thee. But Father, do I–” I was about to ask if I had to serve a mission. But this thought came: God doesn’t force anyone to do anything… no one has to do anything. So I began praying again and rephrased the question. “Father, is it really in my best interests to serve a mission?” Immediately that burning feeling intensified, and I felt – rather than heard – the word Yes. That was it. That’s all I had to know. I got up from my knees and crawled on top of my bed. I laid down and cried. I really wasn’t too thrilled at the prospect of serving a mission. I was almost devastated. For those readers who aren’t familiar with how members of the LDS Church are assigned to missions, the applicant doesn’t decide where s/he serves. Rather, members of the Quorum of the Twelve Apostles review his/her application and recommends a mission to the President of the Church – a man who we believe to be a prophet, a man with a calling similar to Moses – and he essentially makes the final decision. He then issues the applicant’s mission call by letter. I had absolutely no control over where I would go. Yet I knew that I would be sent to France. 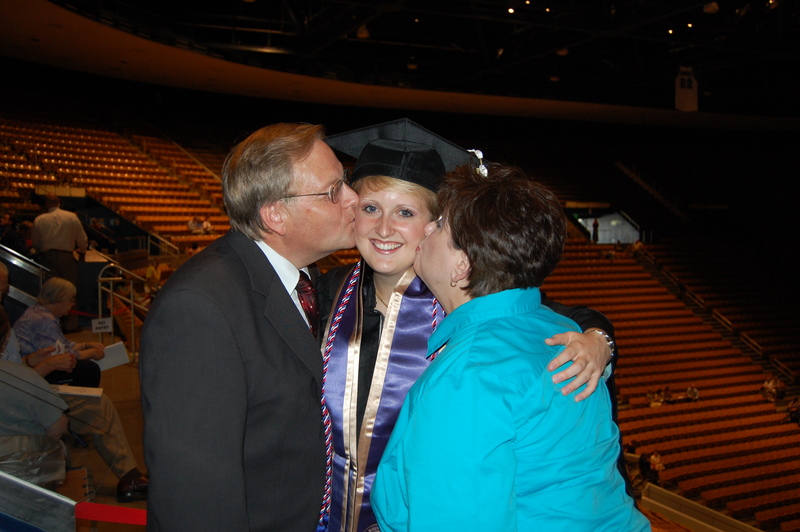 So I called my sister Amber and asked – or rather demanded – that she come to Provo and pick me up so I could talk with her. I didn’t say why, but she’d figured out why by the time she arrived at my apartment. According to her, she said that she knew I’d gotten “thumped.” Seriously, that’s what she said – with a smile and laugh pulling at her lips. She took me out to Village Inn and bought me pie, and we talked about her mission and how it had blessed her. She was beaming the whole time because she was so happy that I was going, and I was hiccuping over my sobs because I didn’t want to go to France and I knew I would. I was heartsick. But I was true to the promise that I made with God in that prayer – I would prepare myself, and then serve. And He was true to what I asked Him to do. Within one week all three of the things that I asked for help with were taken care of. I spoke with my art professors and learned what I had to do to reserve my place in the program, events happened enabled my heart to be at ease in regards to P, and I went out and bought a French translation of The Book of Mormon and began reading it from the beginning. Many other things that I consider miracles happened between that day and the time when I was eligible to turn in my mission papers. (I was 3 weeks shy of my 20th birthday, and back then the age at which females could first serve a mission was 21. Applicants could send in their papers 3 months before their birthday). One of those miracles occurred during the October 2003 sessions of General Conference. The general leadership of the LDS Church address the church membership, and the broadcasts of the conference are sent via satellite to chapels all over the world and are simultaneously translated in over 80 languages. My roommate Ginger and I were able to go up to Salt Lake and attend the conference in person. When one of the Apostles, Elder Richard G. Scott, stood to speak, one of the most amazing things happened. He began talking about the blessings one receives for serving a faithful mission. Despite sitting in an auditorium that seats 21,000 people, it seemed as if he and I were the only ones there. It was like he was talking directly to me, just for me. He addressed concerns that I had. Overall his talk acted as a confirmation that the decision I had made in regards to serving a mission was correct. 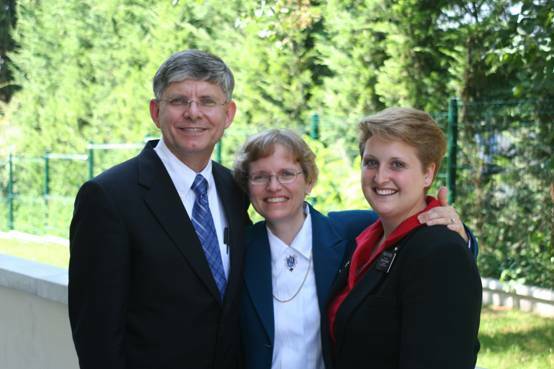 Fast forward to Thursday February 19, 2004, 11 months after that stake conference with Elder Butler and his cheerful sister missionary. My papers had been at Church Headquarters for approximately 2 weeks, and on that day I was sitting in the relaxing quiet of my figure drawing class drawing the live model. Out of the blue I felt these words come to mind: Your mission call has just been decided by Elder Scott. My eyes filled with tears and I had to stop drawing because I couldn’t see what I was doing. Fortunately our professor called a 10 minute break, so I ran up the stairs and went to the computer lab to email my sister, Autumn. Since I knew that Elder Scott’s recommendation would be sent on to President Gordon B. Hinckley within the next couple of business days, I wrote to tell her what had just happened and that I would receive my mission call and packet the next Wednesday, February 25th. Later I spoke with some of my closest friends and said that I’d have my call the next week. They asked how I knew and I said, “I just know it.” One of them said, “You know, Lark, my brother’s mission call took 4 weeks to get to him, and he was here at BYU. Your papers have only been in two weeks – there’s no way you could possibly know when it will arrive.” I shrugged my shoulders and changed the subject. But I was so excited and so happy! By then I’d read The Book of Mormon all the way through in French – I’d already done so numerous times in English – and true to what I’d asked for in that prayer, I’d regained my enthusiasm for French. My mission was by far the hardest thing I have ever done in my life. I had to overcome lots of challenges. I met people who were really rude and antagonistic towards my church and the message that I had to share. But I served the full 18 months, and I was blessed beyond measure. I made several lasting friendships, both with the persons I served and those who I served with. My love for the Savior grew a thousand-fold, and I came home with a deep and abiding love for France, the French culture, and the French-speaking people I met and taught. With one of my best friends from high school – she happened to be in Bordeaux doing a study abroad at the same time I was serving there. We had no idea that the other person was there! Today, ten years later, as I reflect back on what happened on March 9, 2003 and on what I prayed for that afternoon, I am humbled and grateful that God hears and answers prayers. My prayer was quite simple, and in many ways, it was kind of selfish. Remember that I didn’t pray for the people that I’d eventually meet and teach… They didn’t even enter my mind – I prayed that I would learn to love French again. Well, I got a lot more than what I bargained for. Little did I know that that one request would launch me on a path that has allowed me to use my French in some way every single day since I entered the Missionary Training Center on June 2, 2004. 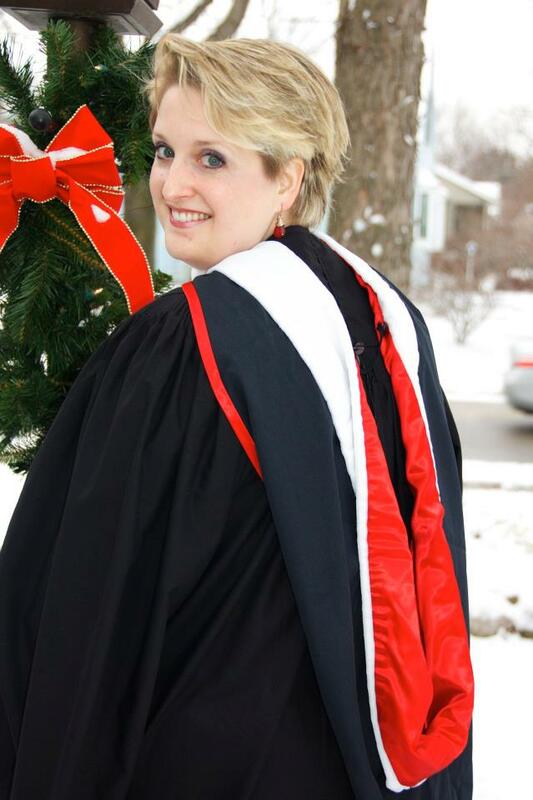 Little did I know that that path would lead me to earn a bachelors degree in French Studies, a masters degree in French literature, and – in the near future – a PhD in French and Francophone African literatures. Little did I know that I would teach French at BYU and at UW-Madison, little did I know that I’d return to my mission area in France and teach in a French high school. Little did I know that ten years from that day I’d be living in Dakar, Senegal conducting doctoral research and gaining a love for the Senegalese and their culture. Lots of people ask me why I served a mission for my church. 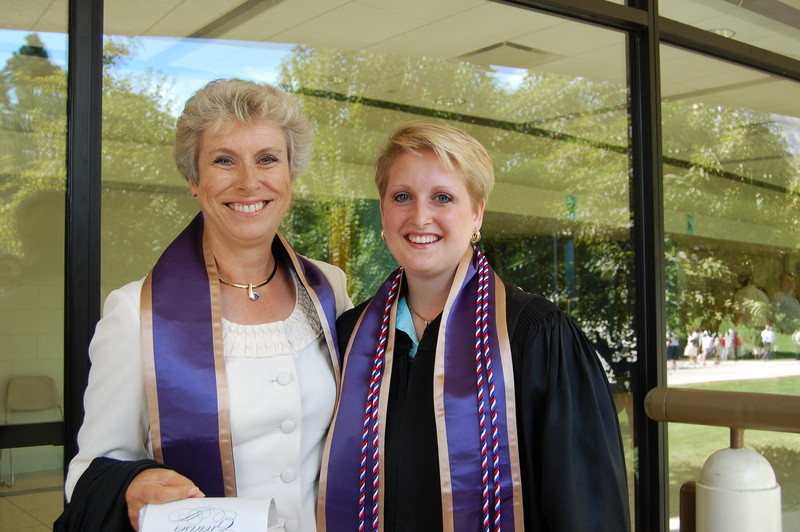 I served a mission because I wanted to be obedient to what I felt that day. I knew where those impressions came from, and I knew that God knew it. I also served a mission because I know how much happiness the teachings of this Church can bring to people. I served a mission because I knew that God loves His children, and I wanted to help people feel that love. Who knew how far reaching the simple words of you need to serve a mission could be? Wait! I Know That Young Woman!